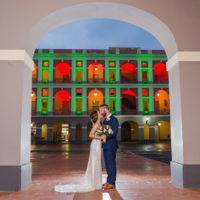 Kayla and Cody's wedding day is one of those 2017 weddings that fell through the cracks and didn't get blogged after hurricane Maria's passing through Puerto Rico. I was so excited to be back doing weddings after the disaster, that I literally stopped blogging everything that happened right before it. Now that everything has healed and I'm back into a Zen place, I've enjoyed looking back at those weddings, and honoring these meaningful moments by blogging them. So, let's enjoy this sweet, sweet throwback together! I didn't talk much with Kayla and Cody prior to their wedding. I knew the wedding specifics: location, start time, and vendors. When I met them on their wedding day, I realized they're a laid back couple who wanted that same vibe to their wedding, so everything was loosely planned (in comparison to the bigger weddings that tend to happen in the San Juan area). I arrived at their family's rental property in Aguada, Puerto Rico, where everything would take place. As all weddings on the west coast, they're prone to afternoon showers, but this day was very rainy. Everyone decided to wait it out for a while, so I got a chance to watch the family dynamics, get to know everyone, and capturing candid photos. We resorted to doing most of the portraits indoors or at the balconies, but the place was so beautiful it didn't bother us at all. Rain is definitely one of the top wedding day stressors, so I was impressed by Kayla and Cody's good mood and happy disposition. They knew they loved each other, they were surrounded by the most important people in their lives, and that was all that mattered. Eventually, the rain stopped, but we had already set everything on the terrace, so the ceremony took place there. It was such a beautiful, short ceremony, after which everyone took their shoes off and followed me into the beach, where we did all the family portraits by the most beautiful sunset ever! When finished with the family portraits, everyone walked back into the beach house, while we finished the newlywed couple portraits on the beach. We went back in for a casual dinner and reception, as I drove back home with a smile on my face.